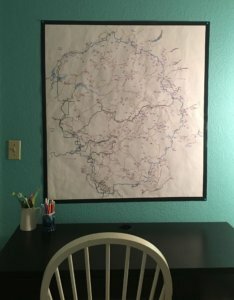 I own a very sensible map of Yosemite: double sided, waterproof and full of details. That’s the exact opposite of what I need for planning this 800 mile thru-hike. I need to see the big picture, as well as the details. My first attempt at making a map failed. I was all out of tracing paper, so I traced sections of the map onto wax paper. Then I tried to piece the sheets together. Did you know that wax paper repels super glue and duct tape!?! Wax paper is actually very impressive and frustrating all at the same time! That’s when I switched tactics. I decided to use the sliding glass door as a giant light table. 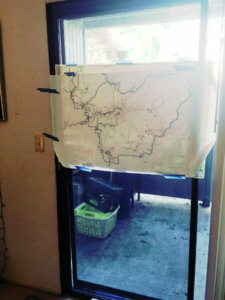 Using painters tape I attached the store bought map to the glass door and then taped a sheet of butcher paper over it. 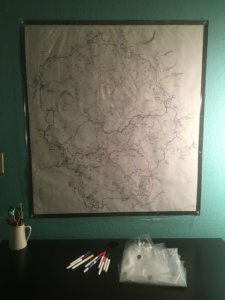 I traced only the vital information on my map: the Park’s boundaries, trails, roads, lakes and then I added in the mile markers and I labeled everything. 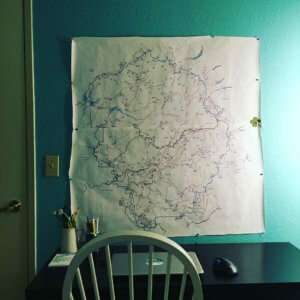 Once it was over my desk I must admit I was very proud how well this map turned out. Pretty good for a free map. But my inner picture framer had to put a frame around it. Back to the kitchen floor, I squared up the butcher paper and added a boarder of black duct tape. Now that I can see all of Yosemite at once, how can I easily sketch out potential loops? There are 800 miles of trails in Yosemite, and if I hike 50 miles a week, that equals 16 loops to plot. I prefer working with my hands (as opposed to using Google Maps,) so how can I easily brainstorm route ideas on paper? First I thought I wanted a giant piece of tracing paper. Oddly enough this is very difficult to find. Local shops don’t carry pieces that large and Amazon sells it by 50 yard rolls. I only need 3 1/2′ x 3 1/2′. Then I got a tip from a carpenter friend (thank you Dan!) on the name of a local drafting supply store, which should have what I need. That got me thinking, what exactly do I need? 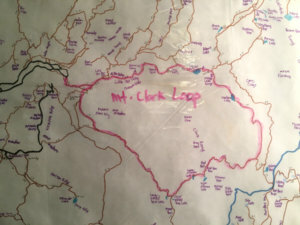 I want to quickly sketch loops, figuring out how to cover all of the trails, while minimizing having to backtrack over sections I’d already hiked. I’d need to keep in mind the starting and stopping points, so that I would end up near food so that I could resupply. After mulling it over, it occurred to me that I need a laminated map. Or something clear and plastic over the paper map. What about a clear painters tarp? I tried the local hardware store and 3M was written all over the tarp! That wouldn’t do. What about a clear shower curtain liner? Two dollars later I was the proud owner of a shower curtain liner and colorful dry erase markers! Once the route is finalized, then I’ll transfer it onto a giant piece of tracing paper. Or perhaps I’ll draw it onto the original. Or maybe I’ll digitize it. I’m not sure, but I have what I need to get started with plotting my 16 loops! 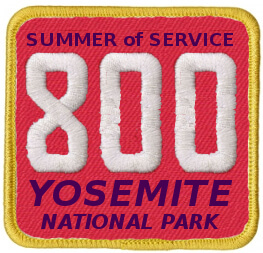 This was Day 3 of the 31 Day series on the Summer of Service, planning a 800-mile backpacking thru-hike of Yosemite National Park. Your brainstorming yielded exactly what you need and want. Well done. Thanks for giving the parameters of your process. That is helpful.